Chess was mentioned in many boy's activity books and chess sets were widely advertised in newspapers so we would assume it was a moderately popular game. The copyright date in this reproduction isn't clear but it looks like the original was published in 1864. 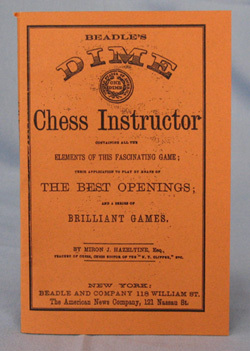 It starts with basic information about each of the pieces, terms, and the "Laws of Chess. Then it develops into a discussion of more complicated moves and concludes with a collection of classic openings. A useful book for the beginner and also for someone wanting to improve his or her game.